Play on: UNDER 58 points. It’s been a difficult assignment trying to ascertain a major edge inside this Bowl game, but these two have key differentials that equally affect the bottom line indicating a dead even tie after four quarters! Although one of the more disturbing angles is the fact the MAC did not win a bowl game last year just about…0-5 SU, gives us a good reason to look at the total here. 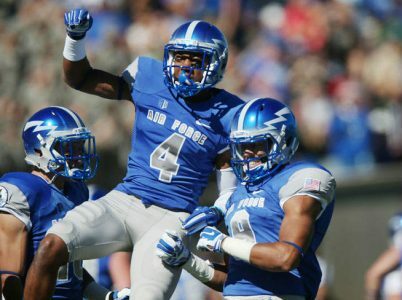 WMU shows 7-4 SU (10-1 ATS), Air Force comes in 8-3 SU (6-5 ATS). The Falcons have a major edge running the football (248 yards per game), the Broncos field averaging 263 yards a game through the air. The Broncos have a net +9.0 point differential overall, AF starts with a net +5.0 differential. For the Falcons 8-3 SU is a monumental bounce back after a horrid 2-10 SU season last year, which left key injuries on the field and much discord. No doubt Air Force illustrated difficulty stopping the pass this season, but the AF game plan will be to control the tempo with their running game, an edge in TOP. From the technical standpoint, Western Michigan has shot UNDER 6-of-7 vs. a >.500 unit, while the Falcons show 6-1 UNDER the number in games with a winning school. We close with AF 10-2 UNDER against non-conference entities….GO UNDER! As of December 18th we have gone on a SUPER RUN in the NBA, 21-4 to be exact. We have been RED HOT on the TOTAL BOARD in all sports…During December our NBA totals have not lost, a PERFECT 6-0. WE CLOSED THE COLLEGE FOOTBALL SEASON ON A MASSIVE RUN AND A +$35,340 PROFIT #1 IN THESE PAGES. IN ADDITION, OUR HOOPS HAVE BEEN ON FIRE AS WE ENTER THURSDAY #2 IN BASKETBALL OVERALL, WHILE BEING RANKED #2 OVERALL IN MONIES WON. IN ORDER TO EARN THIS WINTER SIGN-IN FOR THE REMAINING FOOTBALL AND THE HOOP SEASON THROUGH THE NBA PLAYOFFS, AND SAVE REAL MONEY. BY THE WAY, WE FINISHED #1 IN MLB TOTALS LAST SEASON, SO THERE IS AN ADDITIONAL FACTOR TO CONSIDER…GOOD LUCK AND HAPPY HOLIDAYS!